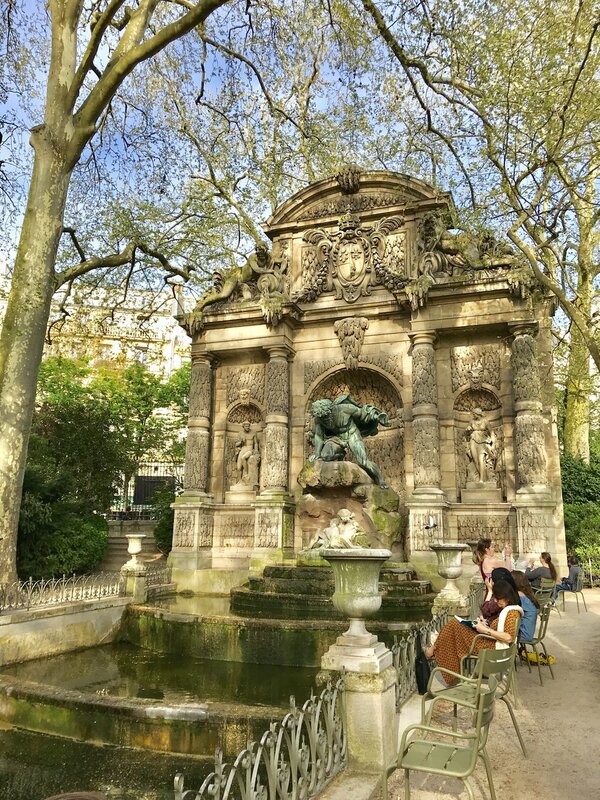 Like Hemingway, one could catch me traversing the rues and chemins near the Luxembourg Gardens on any given sun-drenched day. Coincendentally, I can see Hemingway’s earlier apartment from my west facing couch; but just the tip of the building, which seems to hold the the setting sun longer than the surrounding buildings, remaining a golden pink for one minute more. Maybe it’s not his building exactly, not that it really matters, but I’d like to think the sun shines a little longer where he inhabited. Reading A Moveable Feast, Hemingway’s memoir recounting his time in Paris, felt a kindred-spirit, almost eerily so, for the beginning few chapters could have been written of my time in Paris. I began the book only a few days ago and was surprised at the serendipity. The streets and statues he notes in A Moveable Feast have become my friends and guided allies through the homesick days of Parisian life. Bars he frequented sit prettily on boulevard corners, shining with glamour only the past can instill, beckoning to pursue creative endeavours. Most incredibly though, is his written love for the Jardin du Luxembourg, my most beloved park in all of Paris. His early years in France brought him through the Luxembourg daily, his daily routine and mid-morning stroll, sometimes making his way to visit the infamous Gertrude Stein or otherwise gaining inspiration from the then Luxembourg Museum. I can picture him now, strolling hands clasped behind his back, meandering lost in his thoughts, through the winding paths under the grand horse chestnut trees, through the paulownians and marble statues and fountains. Maybe he’d sit in the sunny meadow like me, by the elk statue protecting her family, writing and contemplating what brought him to this exact moment in life. Would he prop his feet up, tilt his head back and soak up the heated rays? Would he smile when he thinks of his life, the complexities and wonder and liberation? Would the newness of an early spring inspire a bittersweet twang of hope and sadness? As he made his way back home, after he’d exhausted his own mind, through the picnic-clad grounds, strolling past the lawful 17th century Palais du Luxembourg, admiring the seasonal tulips in an early spring, I like to hope he was at peace. Not forever, of course. But at least in the Jardin du Luxembourg, where the city melts away and possibility is within reach, I imagine his heart was a little less heavy.